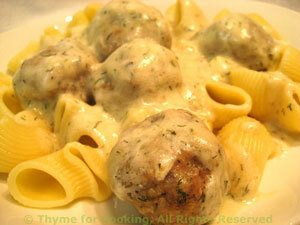 Swedish Meatballs, Healthy Weekly Menu Plan. These were standard fare along side the Lutefisk at the church suppers I went to as a child. As far as I know, they still are. I have updated them a bit.... If you have any mascarpone left - add it with the yogurt. Traditionally served with egg noodles (home made) I usually use any bite-size pasta, preferably a bit 'hearty'. To stick with tradition you could make small dumplings or hand cut noodles. The dill is the secret to this dish. Cook noodles or pasta according to package directions. When done, drain and toss with butter. In medium bowl combine onion, half of the dill, the egg, bread crumbs and beef. Mix well and form into small meatballs, about 1" (2.5cm) in diameter. In a medium skillet with lid heat the chicken stock. When simmering add the meatballs, being careful that they don't touch. Cover and continue to simmer until done, stirring and turning the meatballs once or twice, about 15 minutes. Dissolve cornstarch in 2 tbs chicken stock. When meatballs are done add the dill to the sauce and move the meatballs to the sides of the pan. Turn up the heat a bit and add the cornstarch mixture, stirring until thickened and clear. Remove meatballs from heat and stir in the yogurt, mixing well. Sliced carrots, quickly braised in chicken stock and dill, and finished with a dollop of Greek yogurt. Peel carrots and cut into rounds about 1/4" (.6cm) thick. 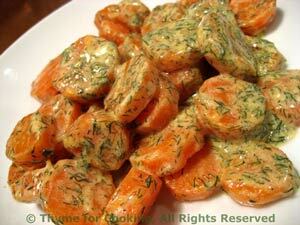 Put carrots, stock and dill into a small saucepan or skillet. Bring to a simmer over medium heat. Reduce heat and let simmer until just tender, about 8 minutes. Uncover and cook off all but 1 tbs stock.